Gold had a little move to the upside yesterday and reached new near term highs. This morning the precious metal is at $1758 a touch lower, but still very much in its short term bullish uptrend. The bulls must be eying up the $1800 level, but the resistance at $1767 and $1790 needs to be overcome first. Gold was pretty much flat on the day and couldn't quite take on the $1750 level. This is just about the only one of the most popularly traded markets that our spread betting account holders are actually long of and so they are hoping for further strength towards $1750 and beyond. If the risk appetite sustains itself then we could see continued strength in gold as the bulls take on resistance seen at $1760 and $1775. Brent was in demand yesterday in line with the equity market rally and the black gold continues to be well supported by geopolitical tensions between Iran and the West. The improvement in manufacturing data across the board also kept the commodity in demand. This morning Brent crude oil is at $112.20 and support and resistance is seen at $111.00 and $112.80 respectively. The gold spread betting market continues to hover around its recent highs and this morning is at $1738. Underlying strength in the precious metal seems to be coming from both angles with the price getting support from both increased risk appetite as well as risk aversion when the euro gives back a little bit. The bulls will be targeting $1748 and $1760 meanwhile support is seen at $1703 and $1680. With a stronger US dollar, gold found it hard to break into positive territory yesterday, ending the session down $8 at $1729.5. It seems investors around the world were yet again nervous about European debt woes, helped by the lack of an agreement materialising with Greece's creditors over the weekend, which dampened the bullish momentum. Another factor in the decline may have been profit taking as traders looking at their gold technical analysis may have thought that the precious metal was getting too high above the moving averages. Nevertheless, at time of writing, the yellow brick has made ground and added yesterday's losses back on to the price with a tad more, trading at $1743.1. Concerns over Iran's nuclear powers were alleviated in yesterday's session as the International Atomic Energy Agency began its visit to the Middle Eastern nation, showing that they're not completely closed off to dialogue. Something else to consider in the day's decline was risk adverse investors finding safety in the US dollar, which in turn helped drive crude prices lower. At time of writing, Brent is up on the day at $111.62. After plummeting from its record high of $1920.9 towards the end of last year to lows of $1522.4 on the back of EU woes, investors are now starting to view gold as a safety haven again. This is especially true given that last week the Fed told the markets that US interest rates were going to stay low until at least 2014. It appears that confidence is being reinstated into investors' minds that Greece could at the very least avoid a default in the short term. The precious metal rallied $18 on Friday to close at $1738.4, a level last seen on December 8th. Currently, the shiny brick trades down on the day at $1720.5 as it declines in line with other risk assets. Even with a weaker dollar, energy investors couldn't keep crude oil prices up and instead followed the slumping equity markets. A slower than projected growth for the US economy, the biggest oil consumer, heightened concerns that demand for black gold could drop and this showed in the trading session. On the other hand, the 2.8% growth was the fastest in more than 18 months and the US economy is expected to surpass Europe this year which helped limit the losses during the session. Brent is a little softer this morning at $110.90. The gold spread trading market was also in demand after its initial big spike on Wednesday then that strength continued through to yesterday as the yellow brick smashed through $1700 and onwards to $1730. The profit taking across risk assets has filtered through to gold as well which is a little lower this morning to $1717. 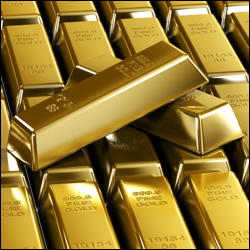 The bottom line for gold is that if the US is thinking about more monetary easing, gold is likely to be a one way ticket and clients remain heavily long of the metal. Near term support and resistance is seen at $1703/1680 and $1730/1738 respectively. Spread betting investors long of gold yesterday evening would have been whooping with joy. The precious metal doesn't pay interest so during a time of low interest rates it is often bought as an alternative asset. This was certainly the case yesterday as, after the news from the Fed that rates would remain low into 2014, there was a spike of some 40 dollars, meaning the highest level since December 12th was reached at $1713.0. In total for the day, $45.2 was added onto the price of the yellow brick, which closed at $1710.6. Support was also given from a slumping dollar and fear of inflation further down the road once the global economy gets back on its feet. This morning the bulls are taking a little bit off the top as gold trades at $1705. The weekly oil inventories report from the US Dept of Energy showed a mixed bag, with crude stockpiles rising higher than estimated yet gasoline inventories dropped against expectations of a rise. On the back of this, the crude oil spread betting market remained around par until the Feds statement that interest rates were staying low for longer, which caused a slight rally, but only enough to push prices marginally higher. At time of writing, Brent crude trades at $110.41. Gold had a go at the $1680 level yesterday and continues with its upward trend, having bounced its way off support areas during its recent little run higher. Our spread betting account holders remain bullish of the precious metal and will be hoping at some point of a return to the dizzy heights recorded last year around $1900. Carrying on with the bullish trend, gold got another boost yesterday, rallying $10.6 to close at $1676.7. Demand was given a leg up by the slumping dollar, meaning that risk adverse investors were in search for an alternative safety haven amid the European uncertainty. Chartists and those using technical analysis will be aware that the medium term trend has now turned sideways and the chart shows the 9 and 14 day moving averages crossing above the 40 day MA. At time of writing, the precious metal is seeing a small pullback and is trading down at $1672.0. The main driver for crude oil prices yesterday was the announcement that the European Union will ban Iranian oil imports from July 1st. This comes in response to Iran's reluctance to halt its nuclear program and has put the energy sector on red alert. The Middle Eastern nation has threatening to close the Strait of Hormuz which allows around 20% of global crude to be shipped through. The other factor driving prices higher was the weakening US dollar, meaning that crude looked like a good bargain to potential buyers. Currently, Brent trades up at $110.92. Gold ended the week on a high as nervous investors wanted to hedge themselves ahead of a busy weekend with Greek officials looking to strike a deal with the country's bond holders. By the close of business, it had risen $7.7 to $1665.7, the highest move since December 12th, keeping the bullish momentum. Currently, things are still looking good for the precious metal which is trading up at $1669.4. Alarm bells were ringing on Friday after the International Monetary Fund cut its forecast for this year's world economic growth. This led investors to believe that demand for energy would plummet, sending the crude oil market through the floor. No support was provided by the single currency either as there was no deal reached on the Greek's debt burden. At time of writing, Brent crude is up slightly on the day at $110.23 as the EU announces that it will enforce an embargo on Iranian oil from the 1st July.